The United States Strategic Command (STRATCOM) is one of the ten Unified Combatant Commands (UCCs) of the Department of Defense. Its areas of command encompass space operations, missile defense, global C4ISR (Command, Control, Communications, Computers, Intelligence, Surveillance, and Reconnaissance), information operations, strategic deterrence (i.e., nuclear strike capabilities), and counter-WMD operations. STRATCOM is the successor to the Strategic Air Command (SAC), which was both a Department of Defense Unified Command and a Major Command of the United States Air Force. Associated most closely with the command and control of U.S. nuclear assets during the Cold War era, SAC was operationally disestablished during a major reorganization of the Air Force in 1992. Five of STRATCOM’ subordinate commands are component commands found in the four DoD armed services: the Army’s Space and Missile Defense Command/Army Forces Strategic Command, the Marine Corps’ Cyber Forces Strategic Command, the Navy’s Fleet Command, and the Air Force’s Global Strike Command and Space Command. 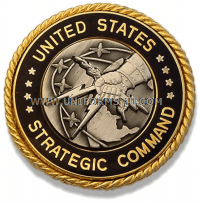 Other subordinate commands of STRATCOM include U.S. Cyber Command and four joint functional component commands. Admiral Cecil D. Haney assumed command of STRATCOM on November 15, 2013 when he was promoted from the position of STRATCOM Deputy Commander. Haney had previously served as Director of the Naval Warfare Integration Group on the staff of Chief of Naval Operations. On 8 September 2016 President Barack Obama nominated General John Hyten to replace Haney; he was confirmed on 20 September 2016.